"Gowanus Underworld," an installation by artist Christina Kelly and novelist Amy Sohn, pairs concrete casts of objects found on the banks of the Gowanus Canal with audio recordings based on true stories from the neighborhood's past. GOWANUS — A longshoreman who saved a drowning toddler, a distraught mother who attempted suicide when her husband left her, and the grisly murder of an Italian immigrant with ties to the Black Hand are some of the chapters in Gowanus' colorful past that come to life in a new art show. 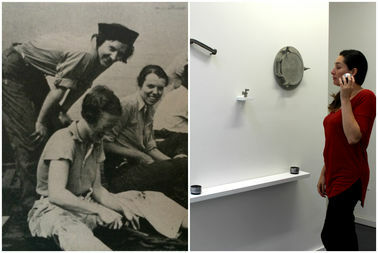 "Gowanus Underworld," by artist and filmmaker Christina Kelly and novelist Amy Sohn connects historical objects found on the banks of the Gowanus Canal with true stories that Sohn dug up in newspaper archives. Kelly cast the found objects in concrete while Sohn wrote first-person monologues from the point of view of people in old news accounts. Viewers of the show will be able to listen to actors performing the monologues as they observe the objects. The show includes a vintage porthole that's paired with a fictionalized monologue of Dorothy A. Bennett, an adventuress who turned a barge on the canal into her summer home in 1936, who Sohn profiled in JSTOR Daily. Another of the monologues is in the voice of the owner of the Coignet Agglomerate Company, an early incarnation of the concrete company whose one-time office at Third Avenue and Third Street is a well-known neighborhood landmark. Sohn said she hopes the show finds an audience with newcomers curious about Gowanus' past and old-timers who've witnessed the staggering changes in the formerly industrial area, where luxury apartments opened on the banks of the polluted canal this year. "As more and more rich people are moving into the Gowanus area, it's important to remember there are very rich stories from Gowanus' past," said Sohn, author of the Park Slope-based "Prospect Park West" and "Motherland." She added, "A lot of people who are choosing to live in Gowanus are intrigued by its past and want to know more about where they’re living, and we’re providing some answers in our piece." Sohn and Kelly wanted the show to highlight the waterway's previous life as an industrial hub, but they also choose stories about women and domestic dramas to draw attention to the families who lived in the area, often in poverty. "Those are the kind of stories that aren't publicized in advertisements for new condos," Sohn said. The show also includes a portable walking tour of Sixth Street between Second and Third avenues that viewers can access on their smart phones. Today the block is home to a metal scrap yard that's about to replaced with a self-storage facility, but in 1915 it was the site of a grisly stabbing. "Gowanus Underworld" is part of a group show at Trestle Projects (400 Third Ave.) called "Falling In," a collection of works all inspired by Gowanus. The opening reception for "Falling In" is Oct. 1, from 7 to 9 p.m. The show will be on display through Gowanus Open Studios (Oct. 14-16) and will close Oct. 22.